On one of my visits to my husbands' hometown, I was testing out a knitting pattern, trying to see if I could get the hang of it. I finished off one fingerless mitt (wasn't really happy with it, and to this day, this particular mitt is still sitting in the bottom of my "to-finish" stack). Well she tried it on, and made an offhand comment that she hadn't ever had a properly made pair of gloves. She couldn't wear gloves because they didn't fit her bad hand, and fingerless mitts left her cold. 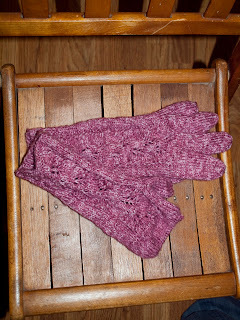 I took it upon myself to try and find a pretty pattern, and to work making a pair of gloves that would serve her needs. I made the left hand just as the pattern described, which was hard enough itself, as this was the first time that I had ever made fingers. It took weeks of putting it down, picking it up, getting frustrated, getting over it and putting it back down again before I was finally done. Then, I left it alone for about week, wondering if I would ever be finished with them. Then in a sudden burst of inspiration, I started and finished the second glove, which turned out to be much easier because instead of fingers, all I had to do was keep knitting and then close off as if for a mitten. It worked great. Overall, not my finest work, the fingers were a wee bit funky, and the cuffs did this weird thing, probably because I didn't do a garter stitch for long enough, but the reaction was all worth it. She laughed and hugged me and tried them on many times for everyone to see. It is this sort of gifting that makes all of my crazy labor over the year worth while. Why don't you try finding one truly unique thing you can make for someone this year? You might be surprised at how it makes you feel!